The Hologram Nova is a global, easy-to-use, and completely open source cellular USB modem available in global 2G/3G and LTE-M and NB-IoT models. 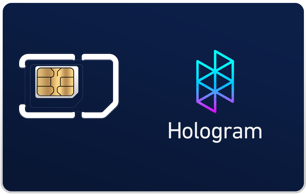 Along with the Nova USB modem, Hologram provides Global IoT SIM cards and Developer Tools to make it super simple for you to bring your cellular solution to life. The Hologram Nova was originally designed to work with Raspbian on the Raspberry Pi, but it’s unique low-level compatibility allows it to operate with any USB host device that is able to communicate over a standard USB port. The Nova is designed with Internet of Things applications in mind. 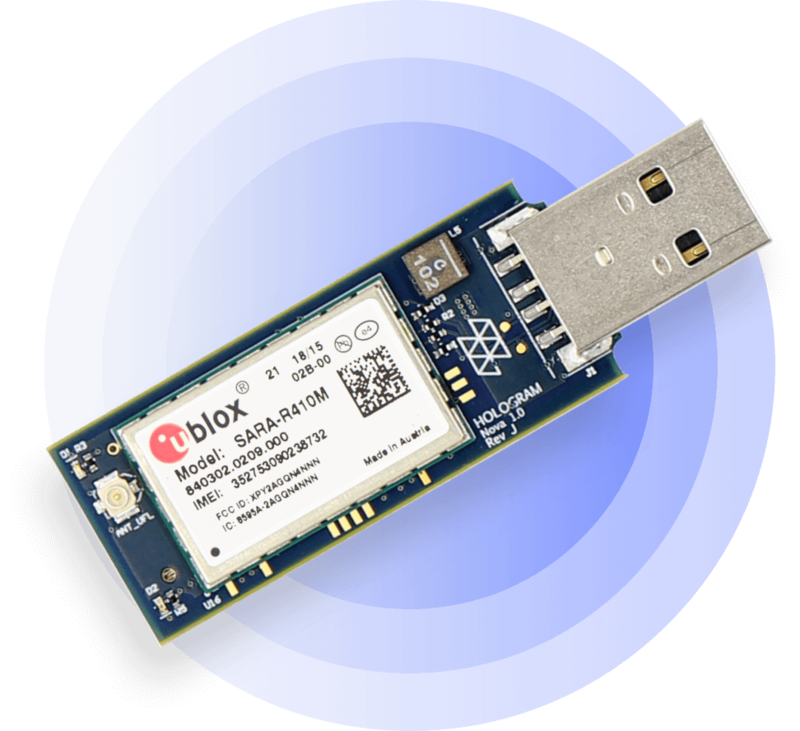 Using the u-blox SARA family which has 2G/3G/LTE-M/NB-IoT modules available, the Nova design allows for rapid expansion into future cellular technologies with a single form factor. The Nova is the future-proof choice for applying cellular connectivity to your devices. The Hologram Nova pairs perfectly with the Hologram Global IoT SIM. For additional pricing and coverage details, check our pricing page. Before the Nova can be operational, the SIM must be activated so that it can gain access to the cellular network. You can use our Connectivity Guide to activate your SIM and connect your Nova to the the Hologram network. The Nova takes the smallest SIM size cutout (nano SIM). NOTE: Do not insert or remove the SIM while the Nova is plugged in - otherwise, the SIM may become damaged or corrupt. We understand that no two IoT applications are alike, and with that, generally comes the need for custom antenna solutions based on specific signal quality needs. Thus, we’ve designed the Nova to be as compatible as possible with an external UFL antenna port, which should be adaptable to almost any cellular antenna on the market. The Nova ships with flexible UFL antennas. Both Nova models ship with antennas that are rated for global radio access and connect using a standard UFL antenna connector. To attach the antenna, firmly press down the gold UFL connector on top of the corresponding UFL port at the back of the Nova board. You should feel it snap on and feel fairly secure. For more on how to get the Hologram CLI and Python SDK installed on your system, see the Quick Start Reference included in your kit. The Nova has two clear LEDs for providing power and connectivity feedback. A power LED that represents whether the modem is on or off, and a network LED that indicates the current network status. Note: Nova LTE-M & NB-IoT modem and Nova 3G/2G modem have same placement of LED color indicators but opposite use for power/network indication. Please use below table for reference. The Python SDK and Hologram CLI are both open source and on Github. Since no two IoT applications are alike, we highly encourage community contributions to help expand the functionality of the Python SDK. 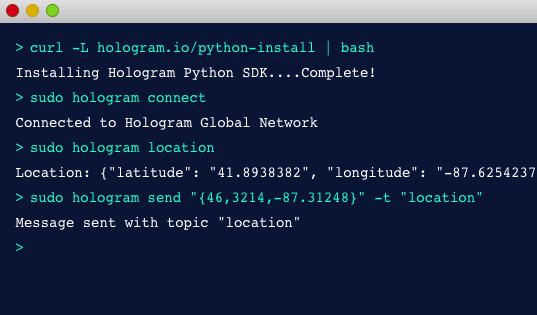 The Hologram Python SDK is built to abstract out the complicated hardware modem communication and make application development as easy as possible. Users can reference the Python SDKs examples and tutorials to implement the applications that fit their custom IoT solution. The Hologram CLI is built upon the Python SDK to showcase how simple and powerful the Python SDK can be. sudo hologram send "Hello World"
The Python SDK offers single line commands for communicating with Hologram Data Engine for simple IoT messaging from your device. In conjunction with the Hologram Nova, Hologram Global IoT SIM, and Hologram Data Engine - the Python SDK and Hologram CLI are able to leverage the full hardware security authentication that comes with the Hologram Global IoT SIM, right out of the box. Hologram’s Data Engine is a message queue and protocol translation layer designed to route data from your embedded devices to other internet-connected services at: https://hologram.io/docs/guide/cloud/data-messages/. The Hologram Nova hardware platform is a global, easy-to-use, and completely open source cellular USB modem available in global 2G/3G and LTE-M and NB-IoT models. For detailed specs and designs on the Nova hardware, see the Hologram Nova USB Modem Datasheet. The Nova is available for purchase from the Hologram store. Bulk orders for volume pricing, or for only the Nova hardware without any of the accessories, can be made by contacting our sales team. Check out our tutorials and guides for the current list of supported devices, and don’t be shy to reach out to our community to suggest features or contribute yourself!